On January 29th from 6-8:30pm, we’re getting together to view new works by Jamie Powell and Melissa Staiger at The Yard: City Hall Park. We are pleased to have this wonderful exhibition, titled Seeker, brought to us by Eileen Jeng Lynch, Founder of Neumeraki. Powell and Staiger’s styles of layering color, texture, and materials, contribute to the playfulness of the pieces and their vibrant presence in our City Hall Park space. The artists’ unique assemblages suggest movement and energy, which is nothing short of warm and inviting! 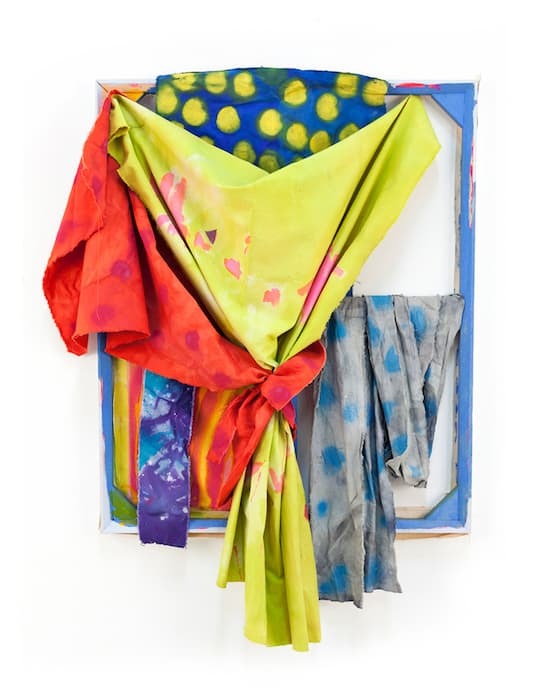 Powell’s modest upbringing in a family of farmers and factory workers in West Virginia has influenced the artist’s use and re-purposing of textile-related materials. 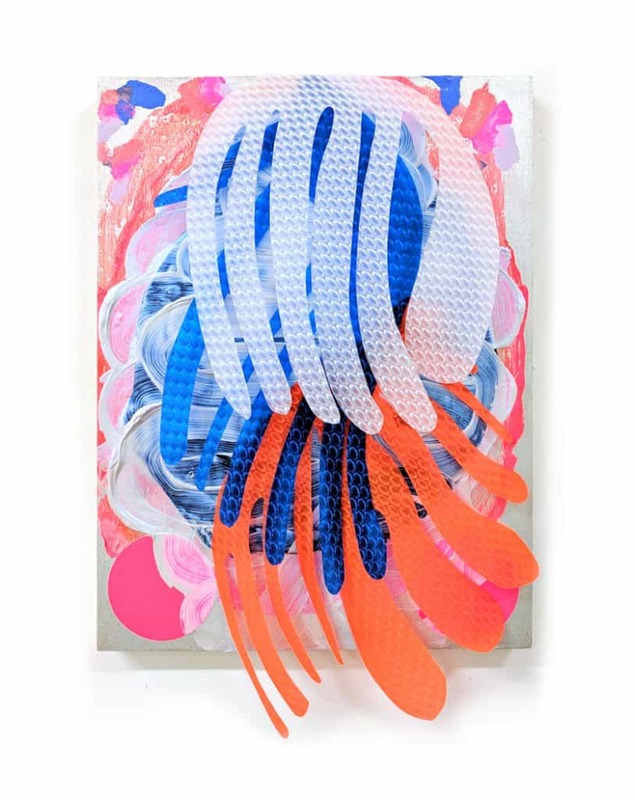 Focusing on a soft edge in her work, Powell tears, cuts, braids, and dyes canvases to create brightly colored, sculptural paintings through an intuitive process. Acrylic and spray paint act as dyes for the canvas. With references culled from popular culture, Powell’s pieces explore domesticity and femininity while subverting conventional notions of display. By revealing the underlying support, her work suggests many dichotomies, including absence and presence. Employing humor, Powell formulates titles and compositions that imply a human presence or personality. For Staiger, paint—along with other materials, including paper, marble, wood, and rigid plastic—become sculptural elements. Embracing the hard edge, the artist methodically assembles and arranges gestures, shapes, and lines—layering textures and structures—to create collages and sculptural paintings. Staiger explains, “When working with materials, I listen to their demands.” Seeking stasis, the artist makes connections between the body, mind, and soul. We hope that you’ll join us for this exciting opening reception with our community. To attend, simply send us a note at events@theyard.com. Special thanks to Eileen Jeng Lynch for bringing this collection to The Yard and filling our days with inspiring art that pushes boundaries.